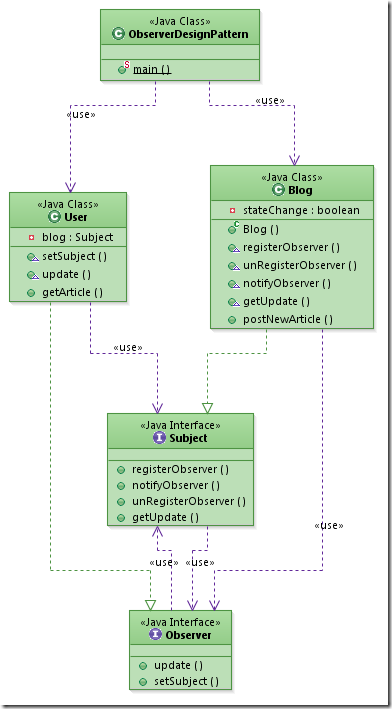 In observer design pattern multiple observer objects registers with a subject for change notification. When the state of subject changes, it notifies the observers. Objects that listen or watch for change are called observers and the object that is being watched for is called subject. Pattern involved is also called as publish-subscribe pattern. Model view controller (MVC) architecture’s core uses the observer design pattern. Subject provides interface for observers to register and unregister themselves with the subject. Subject knows who its subscribers are. Multiple observers can subscribe for notifications. Subject just sends the notification saying the state has changed. It does not pass any state information. Once the notification is received from subject, observers call the subject and get data that is changed. The above last two points are not strictly followed in observer design pattern implementation. Along with the notification, state is also passed in some implementation so that the observer need not query back to know the status. It is better not to do this way. When multiple objects depend on state of one object and all these multiple objects should be in sync with the state of this one object then observer design pattern is the right choice to apply. Consider an excel sheet, data is shown to the user in different views. Generally data is is shown in grid cells and as required different graphs, charts can be created for same data. Underlying data is same and when that data (subject) state changes all the different view are updated. JDK provides Observer and Observable classes as part of util package. This is not something new and these classes were available since JDK 1.0. Observer is an interface which needs to be implemented to observe the state change in a observable subject. Observable is a class which should be extended by a subject. Observable provides implementation for methods to register or unregister an Observer and to notify the Observer objects. Using these APIs, Observable and Observer in real time application may not be possible most of time. As we all know, java does not support multiple inheritance. I can extend only one class and I do not want to exhaust that option with this Observable class. In a real time application I may need that option to be used for business inheritance. Prefer composition over inheritance is a golden rule. So I thought of using Observable in composition than inheritance. That option is also ruled out because setChanged() method has access specified as protected. So as per Java access speficier rules, protected attributes cannot be accessed from outside the package. So the only option left is to do a custom implementation for Observer pattern. It is not a tedious one. 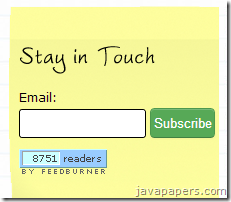 Let us take a blog and subscriber example for observer design pattern sample implementation. Assume that there is a blog and users register to that blog for update. When a new article is posted in the blog, it will send update to the registered users saying a new article is posted. Then the user will access the blog and read the new article posted. In this example, blog is the subject and user is the observer. State change reported by Subject. 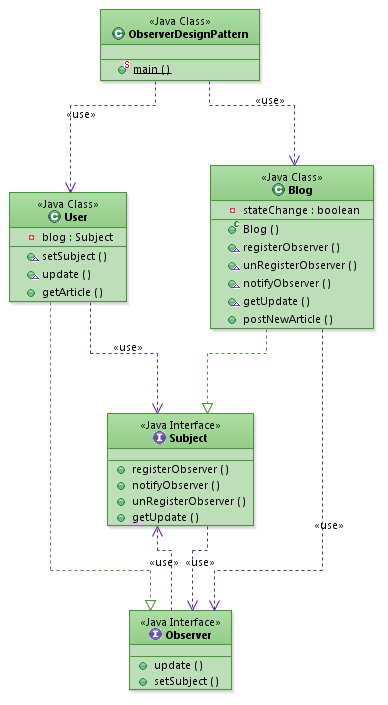 HttpSessionBindingListener is an example where Observer design pattern in used in Java API. Comments on "Observer Design Pattern"
Could you post the name of the program used to create the UML diagram? Why is it not better to do that way? In this case, I think the “Observers” don’t need to know the specific subject, isn’t it a better decoupling way? That is a nice question and it shows that you have keenly observed the pattern. We cannot achieve decoupling because of only this. Since already we require subject’s reference in observer for registration. Registration is initiated from observer side. In the example I have shown, I have not used register(this), so it may dilute this point. But, I have used the client (main method) to make the registration call, so indirectly there is coupling. Hope I have made it clear, Shendio thats a nice question and thanks for asking it. Reading through one good java book is the first step. It is important to learn lots and lots of theory. Second step is to practice code. Apply everything you learn in that project by adding features to it. even i need to know which program you used to generate UML diagram.. Very interesting question indeed. I myself was in doubt when I first got to know about the observer pattern. But, in case you have stuck to the basic design practices, you’ll be fine. 1. Data Hiding – Although the reference of ‘Subject’ has to be passed, but if the ‘Subject’ has exposed just the right information, things will not foul up. a) static references of all the services. e.g. using Enum for all service implementations. b) dynamic dependency injections, but that too uses static references internally. 3. regsiter(this) – Yes, I agree it gives a feeling of standing naked on the top of a building. But, its all about perspective. I would also like to know which software was used to generate the class diagrams. But, here is what I use. And If you too use eclipse, you’ll love it. 5 represents the size of the array. i did not understand it,please make it more clear. Nice Example, this concept is clear. Which part of it Sumit, you are not able to understand? or whole of the concept? I use StarUML, MS Visio for UML diagrams. Looks good at first look. Thanks Gaurav, let me try this. I did not understand the use of ‘stateChange’ variable used in the Observable implementation. Once flipped to true it is never reset to false. That was a very minor comment but as a whole, its amazing how precise (and concise) your articles are. I love reading them. Nice – very useful as always – thanks! Thanks for the article. I was just wondering why you have defined interfaces? Particularly, at some point you implement interface, and then override the function? My question is that, if there is something in the interface that you will define later, why you define it in the firs place? 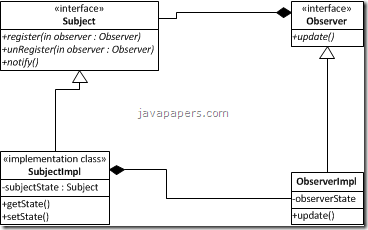 Can you please explain the difference between events concept and observer pattern. Why did you delete my post before Joe? Your email looked like some spam emailid and instantly I have deleted it. Sorry, please post your comment again. Joe – My comment was that although this is a good tutorial. The names that you used for your variables do not make it very clear how the observer pattern works just from reading the code on this site. I had to copy and paste the code and run it to realize how the User was an Observer. Maybe using something like ObservingUser instead of just User would have been more intuitive. Even Subject and Blog seem somewhat strange. None the less, the tutorial demonstrates this clearly but I think it could use some improvement in making it more intuitive. Keep up the good work. Thanks Joe. Comments are closed for "Observer Design Pattern".